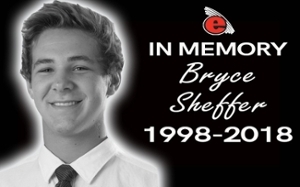 The SIUE community is mourning the loss of freshman College of Arts and Sciences (CAS) student Bryce Sheffer, who died from injuries sustained in an ATV accident on Thursday, March 8 near his home in Morganfield, Kentucky. He was 19. Sheffer was a freshman on the Cougars wrestling team. He was able to wrestle unattached through the 2017-18 season, compiling a 10-6 record, while winning six of his last seven matches in open events at 141 lbs. Sheffer enrolled at SIUE after wrestling for Cougars alum Robert Ervin at Union County High School. Visitation is 2-7 p.m. Sunday, March 11 and 9 a.m. until service time on Monday, March 12 at Whitsell Funeral Home in Morganfield. Funeral services follow immediately at 11 a.m. Monday at St. Ann Catholic Church.